Slugs, Bears and Caterpillar Clubs, Oh My! I was on a quest today as I wandered with friends at the Greater Lovell Land Trust’s Bishop Cardinal Reserve. 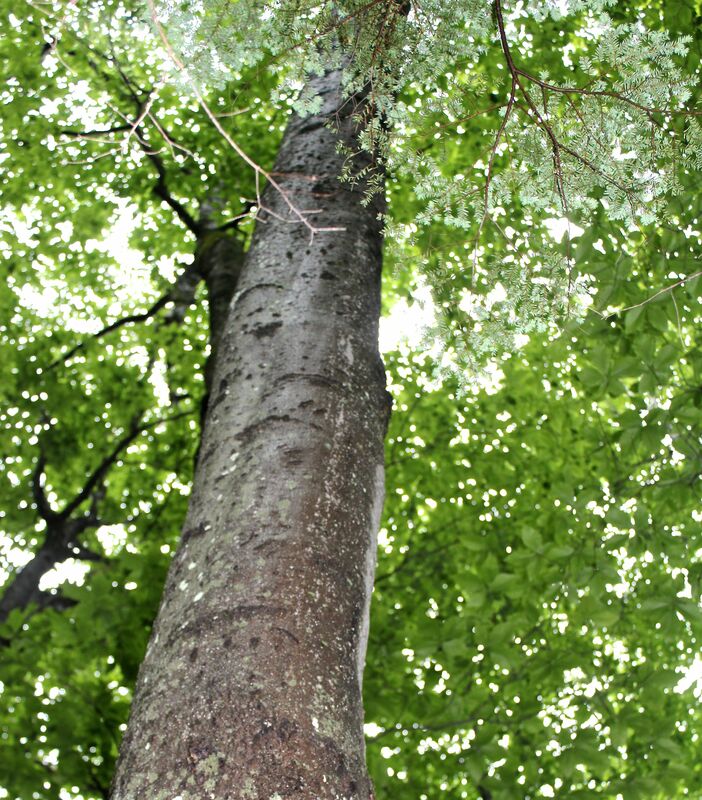 I wanted to return to the bear trees and show them that there are so many more in the area. Thank goodness they are all good sports and don’t mind getting fake lost. But first, I licked a slug again. And convinced a friend (J.L.) to do the same, without twisting her arm. This was my terrestrial gastropod mollusc of choice. And proof. 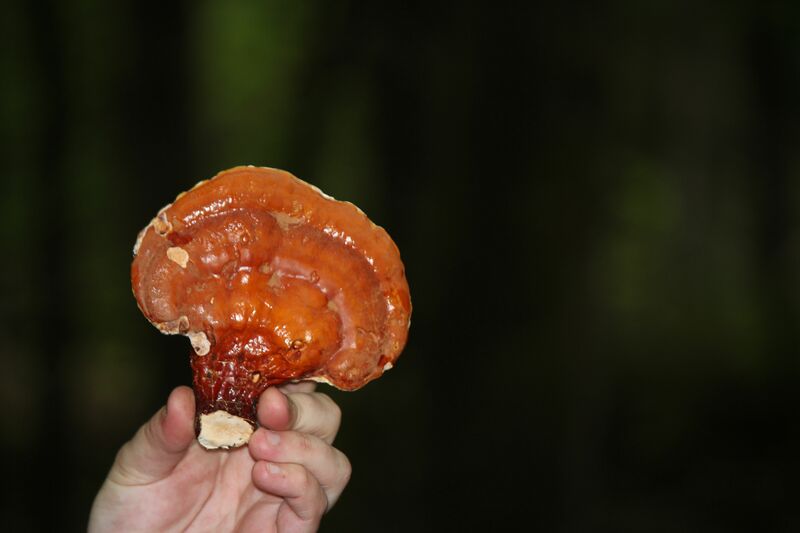 Rather attractive photo–Not–but the slug did numb my tongue a bit. 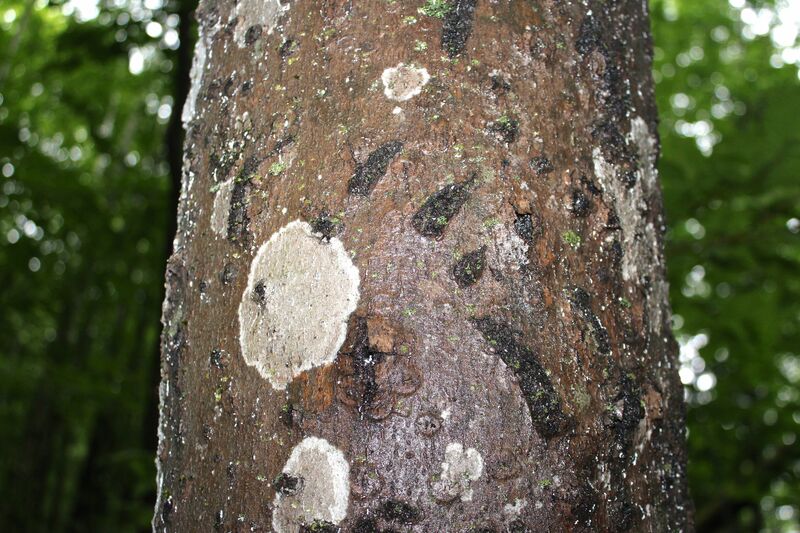 We eventually found some of the beech trees with bear claw marks, but there are more–for another day. Satisfied with our findings, we decided to continue off trail, keeping our eyes and minds open. 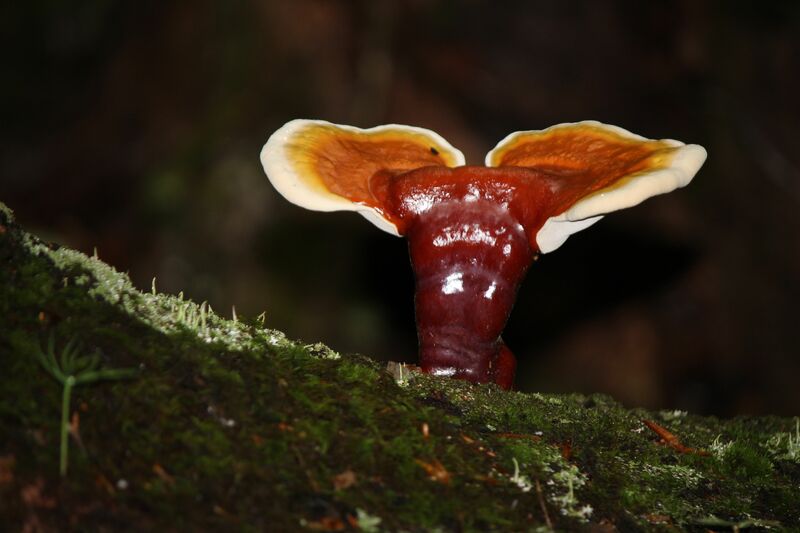 From start to finish, we saw plenty of Hemlock Varnish Shelf (Ganoderma tsugae) fungi. Each one presented itself in a different manner. 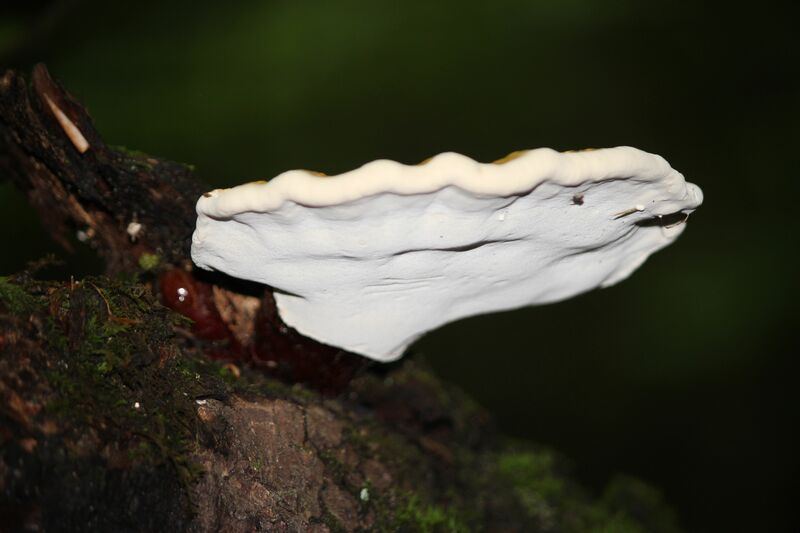 While its shiny, colorful surface and habit of growing on hemlocks and other conifers speak to its name, the oyster-shell rim and non-gilled pore surface are equally attractive. Most were not as ripe as this. I was thankful this day to be among people who have a shared wealth of knowledge about the natural world. They also have eagle eyes. 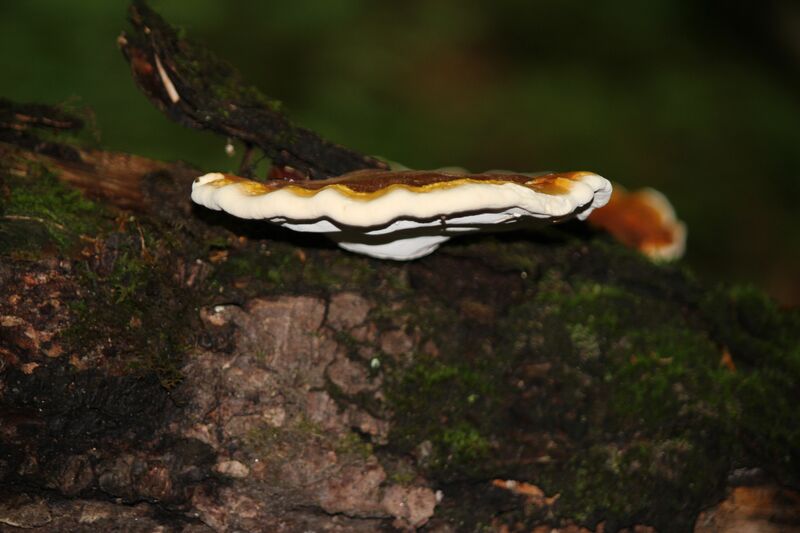 Or in this case fungi eyes (P.V.). 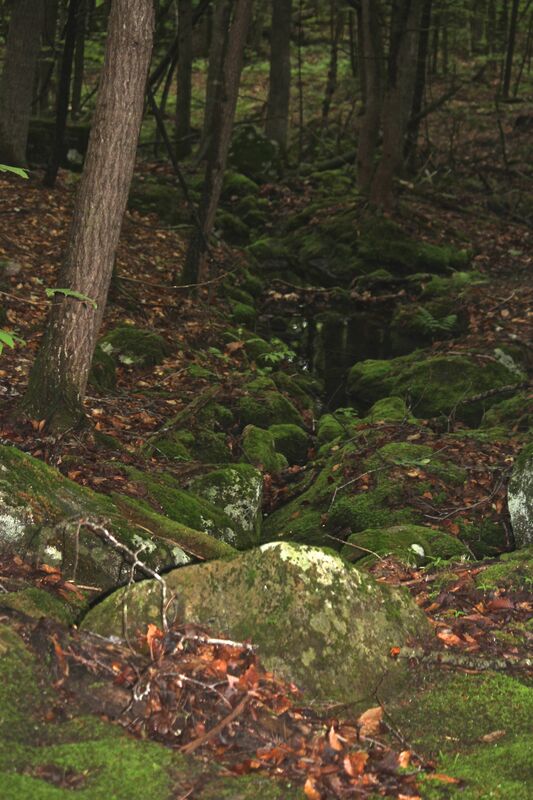 The mossy stream became our focus as we searched for wild orchids and more fungi. Some orchids have passed, others aren’t open yet and still others had been eaten. But the wet habitat provided plenty for us to wonder about, including this Platterful Mushroom, the common name for Tricholomopsis platyphylla, aka Broad Gill. Despite that first common name, it’s mildly toxic and not meant to be served as a platter full. 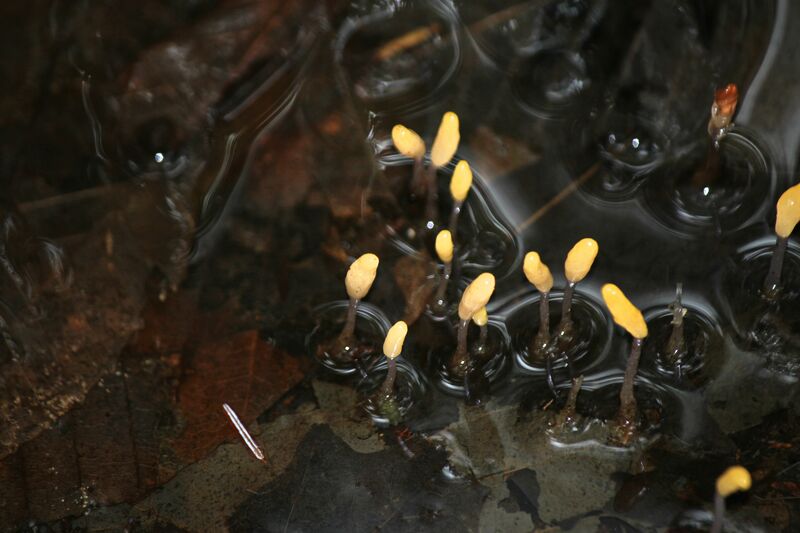 Glowing up at us from a wet depression was a colony of Swamp Beacons (Mitrula elegant). 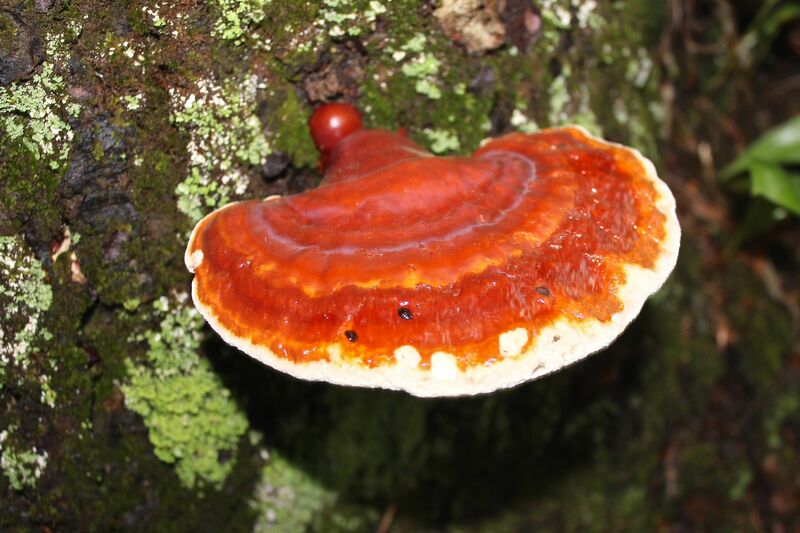 I include the Latin with the fungi because P.V. uses it almost exclusively when he enlightens us. I wish I’d learned the Latin first, but alas, I’m a common kinda gal. 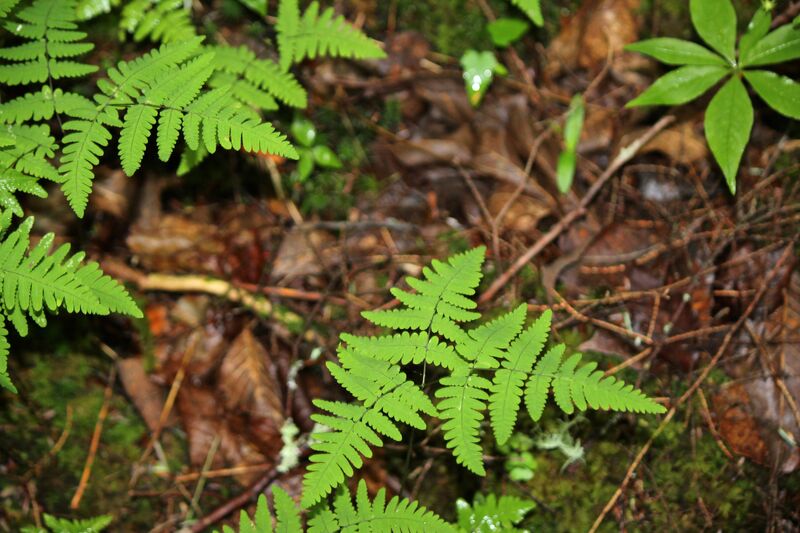 Mixing it up and almost messing us up was the Northern Oak Fern. It reminded us of miniature bracken fern, with a softer texture. We were in a rich, upland habitat, verified by several species, including this one, which D.S. paused by to quiz us. 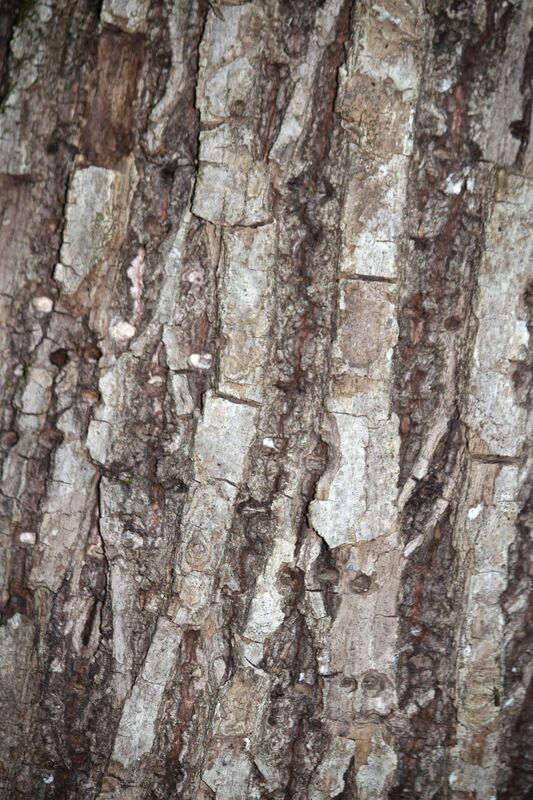 We got it right–American Basswood (Tilia americana). 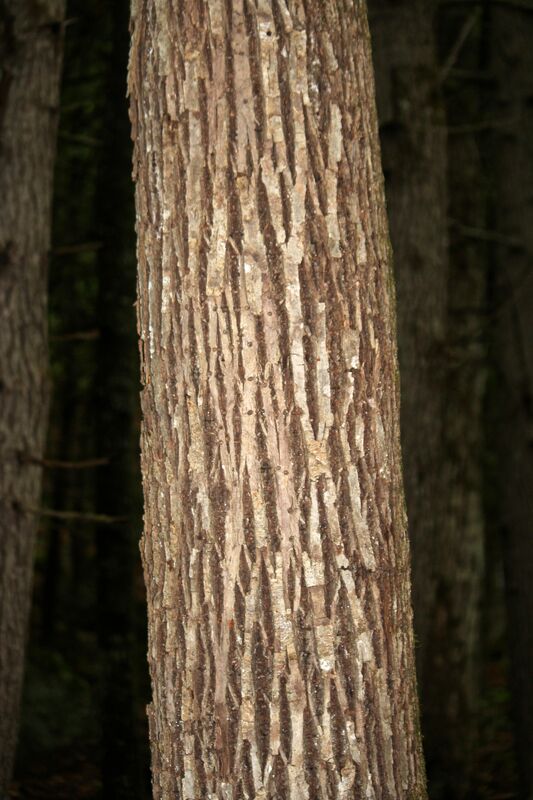 Its flattened, square-like ridges intersect like a woven basket every 6-12 inches. Not only does it look like a basket from the outside, but the inner bark is fibrous and has been used for rope and fish nets and . . . woven baskets. 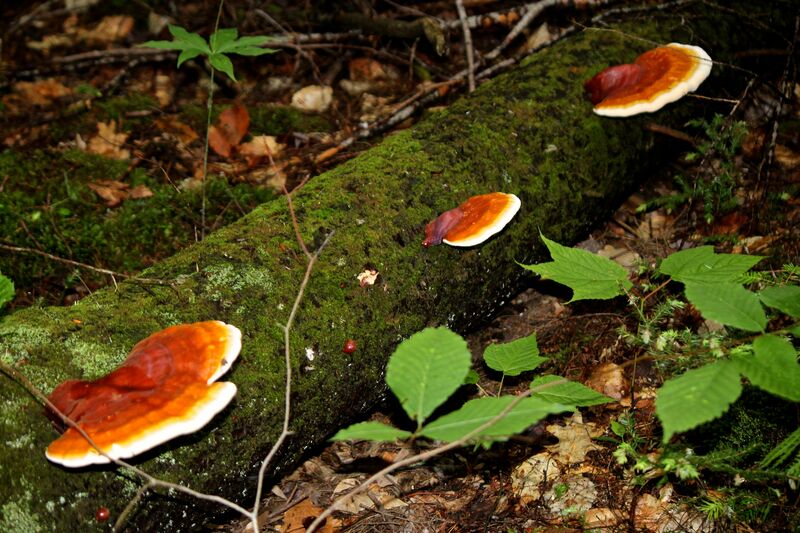 Those fungi eyes continued to search high and low. 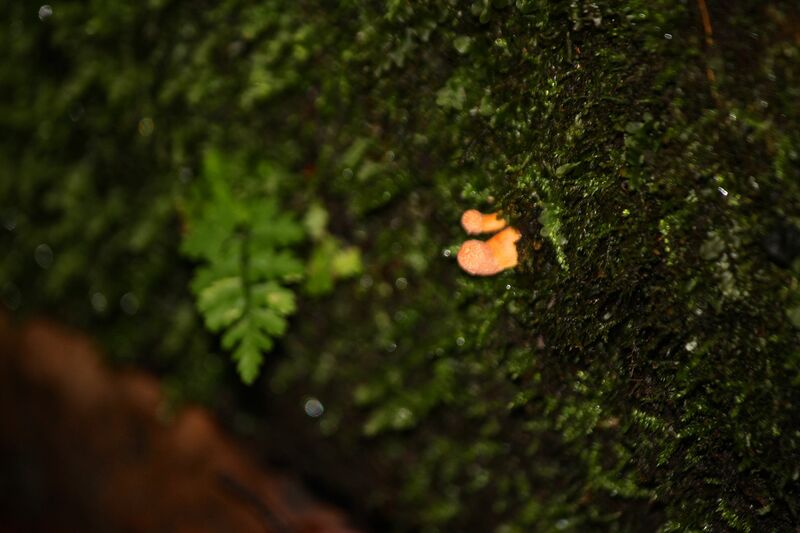 And waited for us to locate this rather small sample sticking out of a moss-covered rock in the stream. 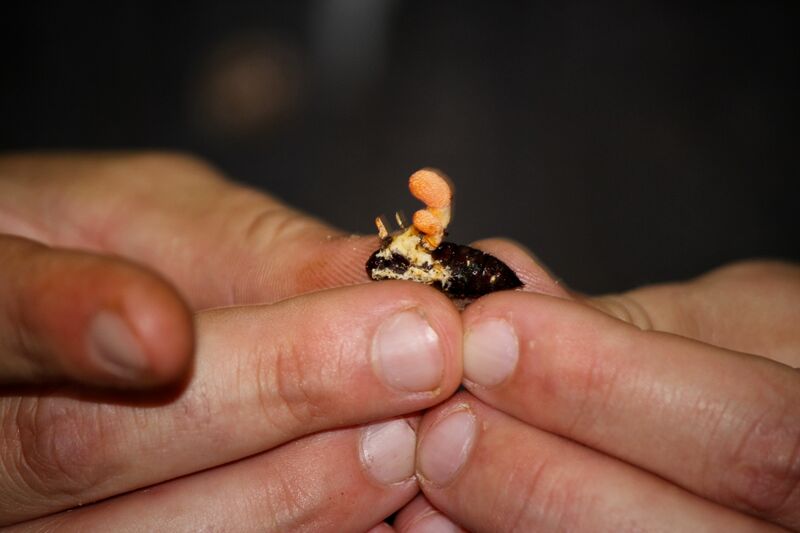 Scarlet Caterpillarclub (Cordyceps militais) feeds off of insect larvae as you can see here. 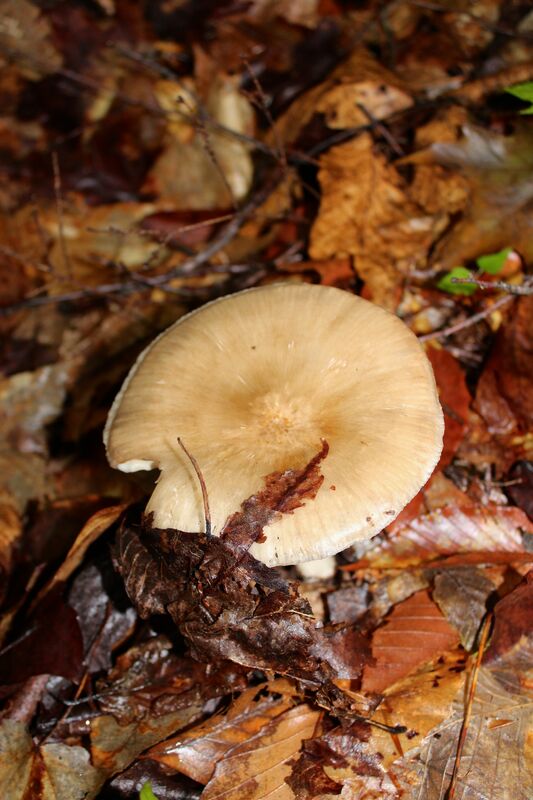 The host provides the most and turns to mush as the fungi grows. Though we never plan it that way, our journey lasted three hours. 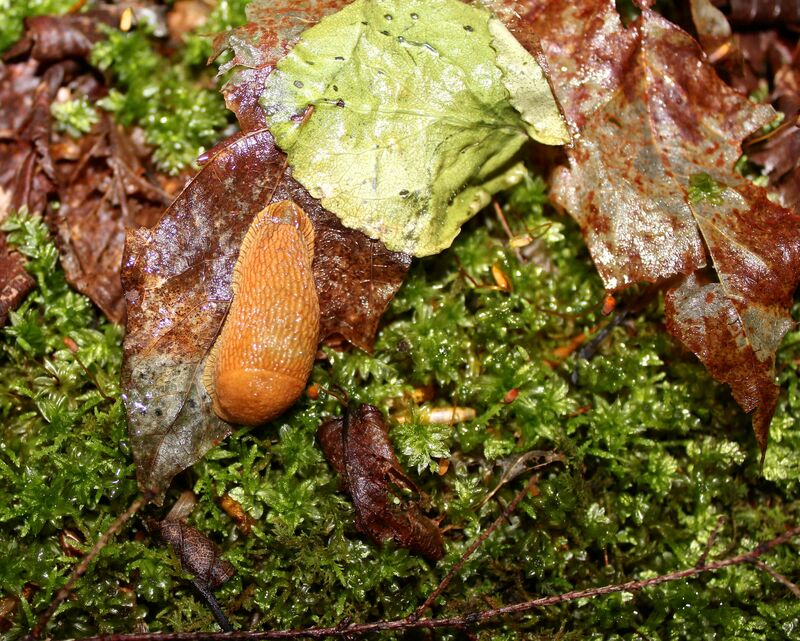 Suddenly, we emerged from the wet woodland onto Horseshoe Pond Road–all the richer for having spent time in the land of the slugs, bears and caterpillar clubs. Oh my! J.L. was licking a slug??? You, I believe, but J.L.??? I love the varnish shelves (not too surprised are you?). 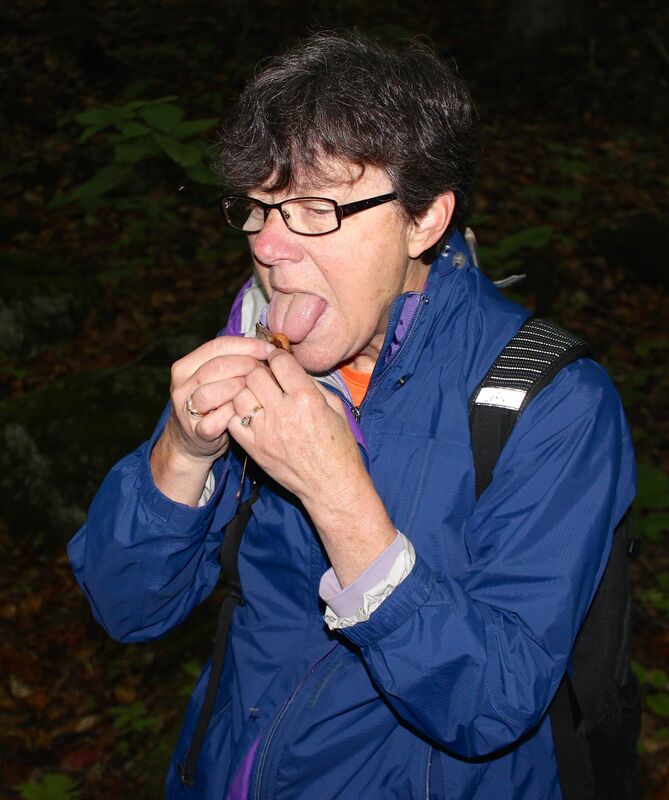 But…why on earth lick a slug? Why not? 🙂 And yes, J.L. did. Her expressions were hysterical. I knew you’d love those varnish shelves. I only showed a few. There were many more.